Need more information about booking Home 169077 ? Situated in a small terrace of former victorian coastguard cottages,Horizons is a beautifully presented, south facing delightful period cottage, enjoying lovely sea, headland and harbour views. Right on the coastal path and only 5 minutes walk away from beaches, the village centre and harbour. The cottage boasts a south facing front terrace and a lovely terrace and garden to the rear to enjoy the sun all day. Wake up to the most amazing sunrise over the sea if you are an early riser! The accommodation is laid out over two floors with gardens to the front and rear. With three bedrooms, A double, twin and single ,Horizons sleeps up to 5 adults plus room for a travel cot so is the ideal holiday cottage for families or couples. With a cosy beamed sitting room opening on to the front terrace with stunning sea and headland views, a woodburner, library of books and games, LCD TV, CD/DVD home stereo system, you can enjoy all home comforts. WIFI keeps you in touch and the beach is only minutes away. The kitchen with dining area is fully equipped with quality kitchen utensils and has a small utility area with a washing machine and tumble drier. Horizons has a south facing sea view terrace with a bench and table and chairs, and the rear garden faces south west so enjoys sun all day and is laid to lawn with pretty flower beds and there is a patio with a comfortable seating area and table with lots of space for the whole party. A stone storage shed is available for bikes, body boards etc. Parking is in the small lay-by in the lane behind the cottage with access through the rear garden. Pet Friendly but note that neither the front or back gardens are secure. Note that there are steps up to the back garden and down to the lane to the beach so not suitable if you have impaired mobility. Short winter breaks available, please contact for terms. Changeover day flexible during winter months, Saturdays for summer months. Horizons has been completely renovated and newly furnished without spoiling the character of the cottage with sea and headland views from the sitting room and front bedrooms. Three bedrooms: 1 x double, 1 x twin and one single. Shower room with basin and WC. Fitted kitchen/ Dining room with seating for six. sitting room with woodburner and exposed stone walls. Electric Central heating with additional heating from the woodburner in the sitting room. Electric oven and hob, microwave, fridge, washer/dryer. TV, DVD. Library of DVDs, books and games. WIFI. Power and starter pack of fuel for the woodburner inc. in rent. Bed linen and towels inc. in rent. Parking in the lane to the rear of property with access through the back garden.Two well-behaved pets accepted. Sorry, no smoking. Shop and pubs and beach 5 mins walk. Enjoy the south and sea facing front terrace for morning coffee and breakfast and take the steps up to the rear garden and patio for afternoon tea and evening drinks for the last of the evening rays. Parking is available in the small lay-by in the lane subject to availability to the rear of the property with access through the rear garden or in the nearby car park. Note that there are steep steps up to the rear garden and steps to the lane to the beach. There is someone next door to assist you if you need help. This Cottage has 3 bedrooms, 1 bathroom and sleeps 5. It’s been listed on Holiday Lettings since 07 Jun 2011. Located in Cornwall, it has 26 reviews with an overall rating of 5. The average weekly rate varies from £573 to £1186. 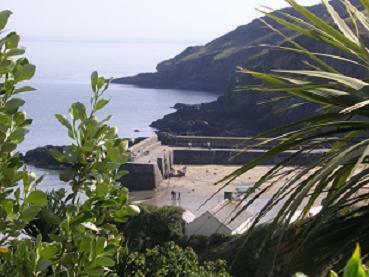 Gorran Haven is an unspoilt Cornish coastal village. The village centre is a short walk away from the cottage, which has been lovingly restored and furnished to a high standard. Carolyn the owner is easy to deal with and there is a friendly bus service to nearby Mevagissey. Owner's reply: Thank you for your kind review, and delighted you enjoyed the cottage and village. Perfectly catered for family stay, village is ideal and beach is perfect and within a few minutes walk. Hope to return next year! Owner's reply: Thank you for your review - it was great to have you stay and that you had a good holiday and hope to hear from you again. Superb former coast guard cottage, sat on the garden bench having coffeee looking out over wonderful views of the sea and over Gorran Haven hard to beet that especially as it was January!! Cottage has everything you may need and is furnished and decorated to a high standard especially enjoyed the log burner in the evening very nice. We went for my birthday on arrival found a card and a lovely bottle of wine little things like this make this a lovely place to stay and we will be going back soon. Owner's reply: Thank you for your kind review and I am delighted you enjoyed your birthday and beat the rain. I look forward to hearing from you again. This cottage is a really well equipped, cosy and inviting. It has fabulous views over the sea, harbour and headland with coastal walks from the village. Gorran Haven is a delightful Cornish village with all the amenities that were need for a very relaxing break. We thoroughly enjoyed relaxing in the delightful gardens especially sitting in the front garden drinking in the views. We stayed in Horizons in March and found no problem using the small layby as Carolyn suggests for parking. The local shop was well equipped and we used it every day, also the Asda in St Austell is massive! Good walks on the doorstep, close to all the best places to see in Cornwall and the Northern coast is not far either. Local pubs: try The Barleysheaf - good local ales and cider - food was good too. Also The Crown in nearby St Ewe was a lovely old pub . A recently renovated coastguard cottage, completed with evident love and thoughtfulness. The nearby cliffs and beaches make for first-rate walking and relaxing. Its proximity to, in particular, the Lost Gardens of Heligan is a definite bonus. If it is this good in November, what must it be like in the Spring and Summer? Owner's reply: Thank you for your review and acknowledging our effort in making a warm, comfortable home. This was much appreciated. The pretty cottage had everything we needed and was very clean and well presented. It is ideally located for the beach, the lovely little shops and the surrounding countryside which is great for walking. We didn't take the car out for the first four days! The people in the village were all really helpful and the shops sold everything we needed including mugs of tea and coffee that we could take onto the beach!. We were so lucky with the weather! There were four of us plus the dog. We enjoyed our stay here as the cottage had recently been refurbished to a high standard and was clean and comfortable with everything we needed in the way of home comforts. We had fantastic Easter weather and enjoyed sitting in the sunny front garden with our morning coffee. The kitchen is well-stocked, there's a good shower and a very comfortable sitting room with a woodburner. The bedrooms are very pretty though the third bedroom would best sleep a child or small adult. It's an ideal cottage if you want a day off from too much activity or the weather keeps you indoors as it's perfectly cosy and comfortable for relaxing, reading, watching TV or playing board games. It's a short walk downhill to the small harbour and local facilities which includes an excellent fish and chip shop! There are lovely coastal walks and within driving distance there is plenty to explore including some great beaches, The Eden Project and Heligan Gardens. If you’ve already booked, go to Manage your holiday booking to view Carolyn the owner's contact details or send them a message. Or send Carolyn (the owner) an enquiry through the Contact the owner/manager form if you’d like a quote or more info first. When you pay online through the Book your stay form, a booking request is sent to Carolyn (the owner). You’ll find out within 24 hours whether they’ve accepted - no money will leave your account before then. You can also request a quote from Carolyn (the owner) through the contact form. The owner will email you the total cost for your dates and a link to book and pay online. Use the Book your stay form to pay provisionally online. You can pay by credit/debit card or PayPal. Carolyn (the owner) will have 24 hours to accept the booking and no money will leave your account before then. Why can't I call Carolyn (the owner) before booking? You’ll need to contact Carolyn (the owner) to do this. Send them a message in Manage your holiday booking or through the contact form on this page. You can request to change the dates or number of people on your booking via the Manage your holiday booking page. To change your holiday dates use the Edit booking button. If you need to change the number of guests staying then send Carolyn (the owner) a message. If Carolyn (the owner) agrees, they’ll send you a revised quote outlining the changes. You can review and accept/decline this from the Manage your holiday booking page. You’ll have 48 hours to take action before the revised quote expires.